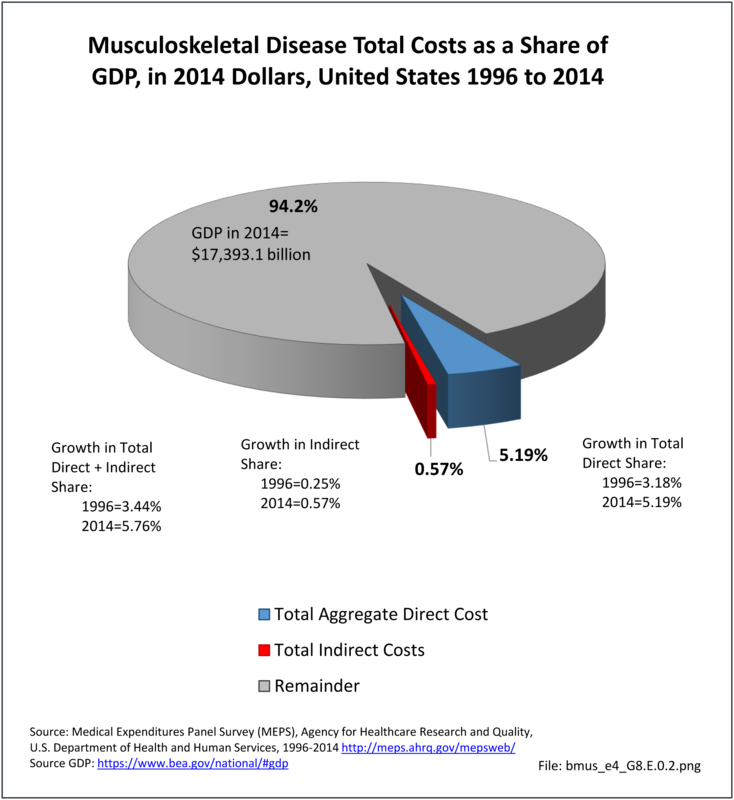 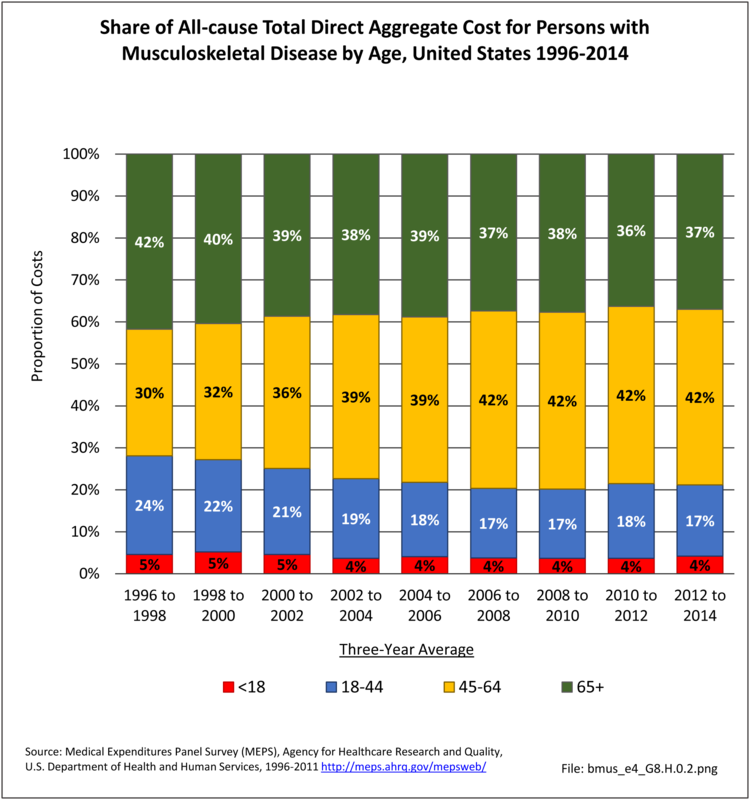 Overall, total average direct expenditures for persons with musculoskeletal diseases increased from $5,020 in 1996-1998 to $8,206 in 2012-2014, in 2014 dollars, a more than 60% increase. 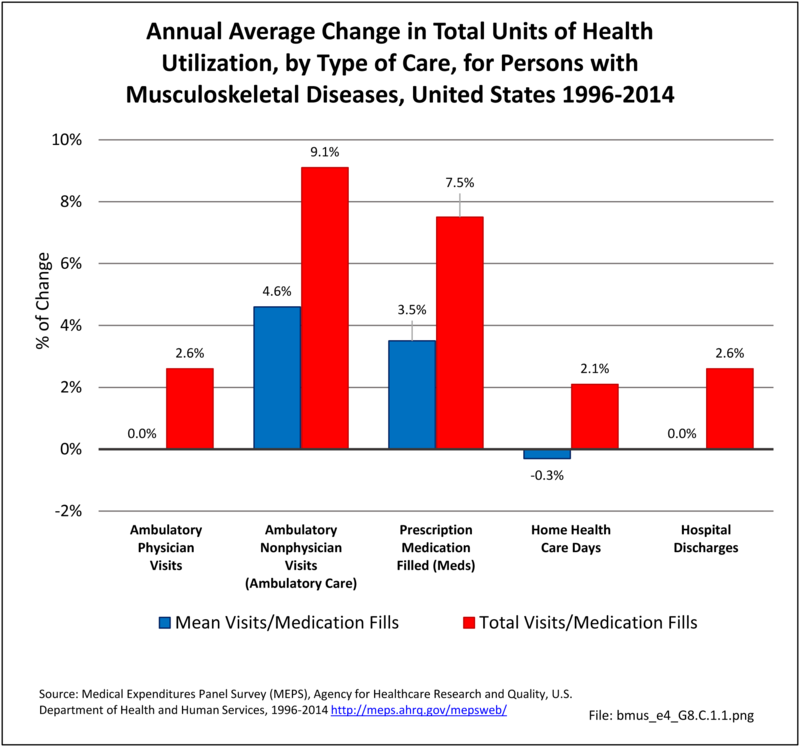 Ambulatory care was the largest cost share and accounted for 34% of total average per person costs for musculoskeletal diseases in 2012-2014. 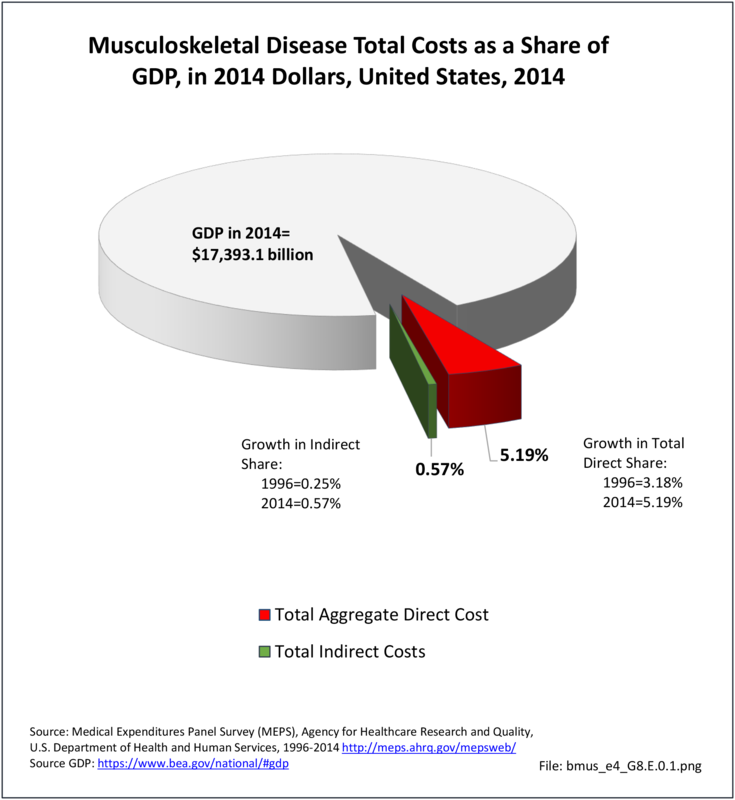 Data for speciﬁc musculoskeletal conditions has been analyzed through the 2012-2014 time period, and shown in 2014 dollars. 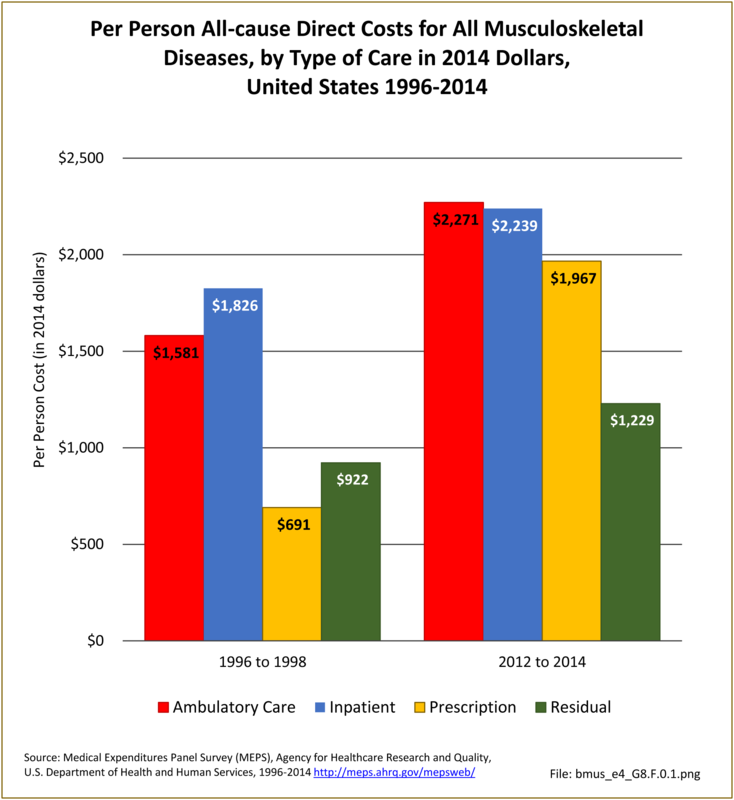 Total per person direct medical care expenditures rose for each of the major subconditions between 1996-1998 and 2012-2014. 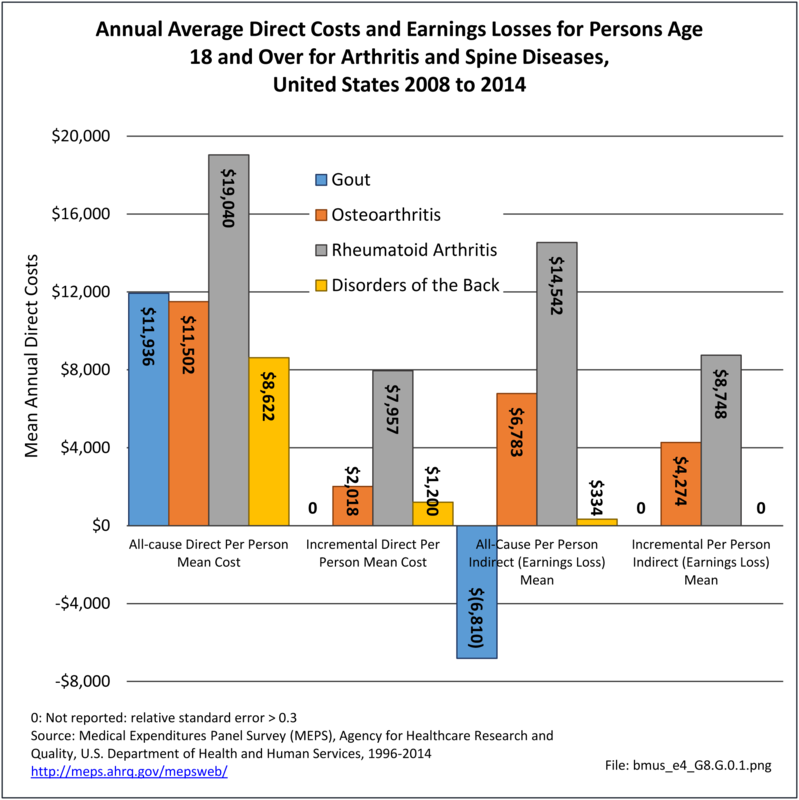 Expenditures for arthritis and joint pain, which rose from $6,642 to $9,554, and osteoporosis, which rose from $8,906 to $12,869 per person, had the smallest relative increases at 44% each, although both conditions had high average per person costs. 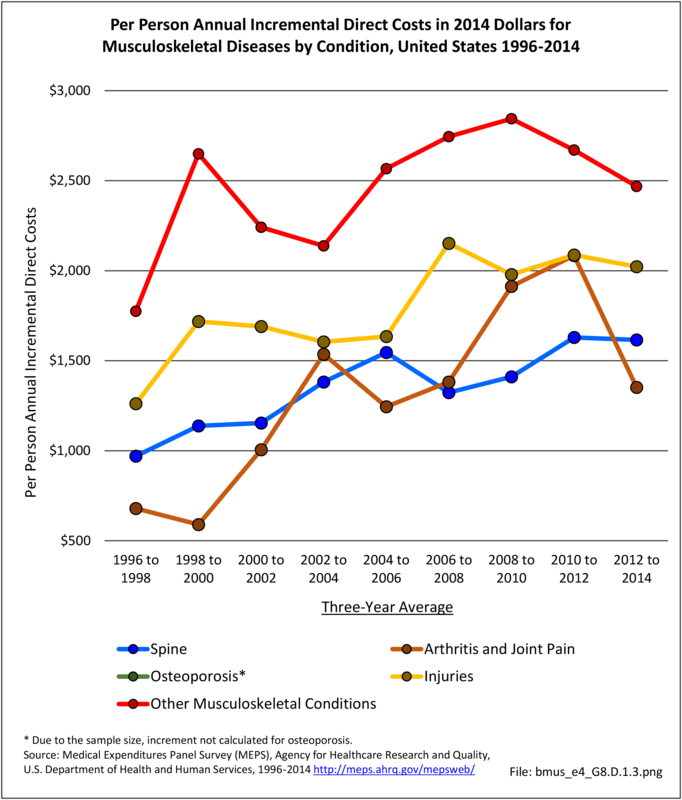 Costs for spine conditions rose by 80%, from $5,023 to $9,035; for injuries by 93%, from $4,211 to $8,135; and for other musculoskeletal conditions by 62%, from $6,799 to $11,047. 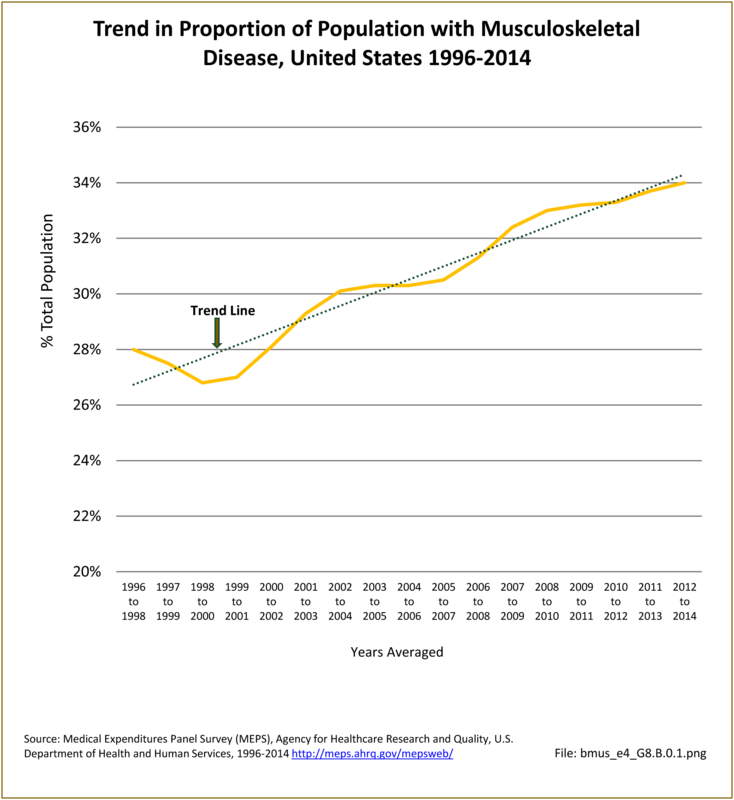 Detailed data related to per person all-cause direct cost by condition can be found in specific condition data tables and is also discussed under the condition section. 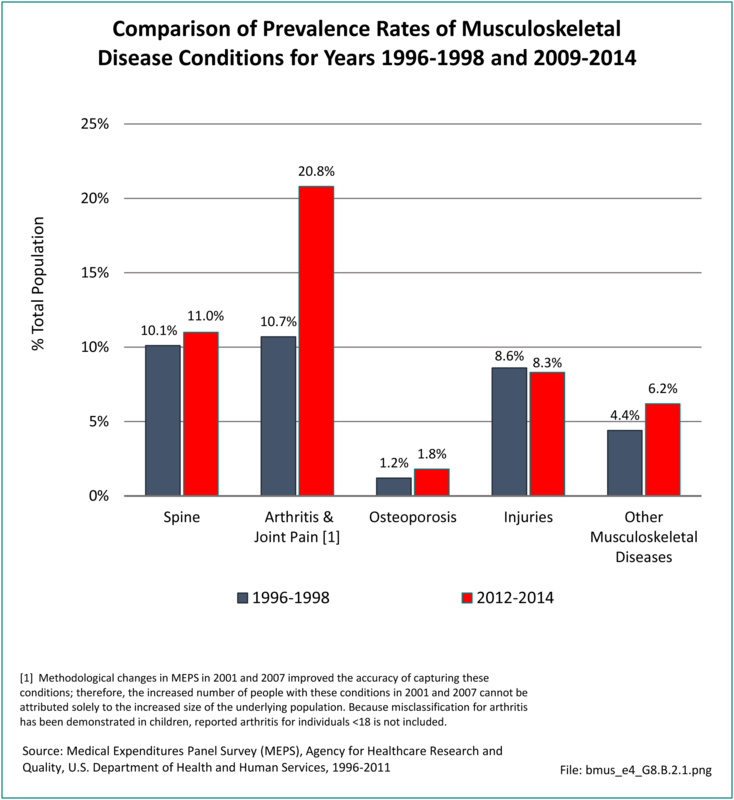 See spine (Reference Table 8.4.2 PDF CSV); arthritis and joint pain (Reference Table 8.4.3 PDF CSV); osteoporosis (Reference Table 8.4.4 PDF CSV); injuries (Reference Table 8.4.5 PDF CSV); other musculoskeletal conditions (Reference Table 8.4.6 PDF CSV); and summary (Reference Table 8.7 PDF CSV). 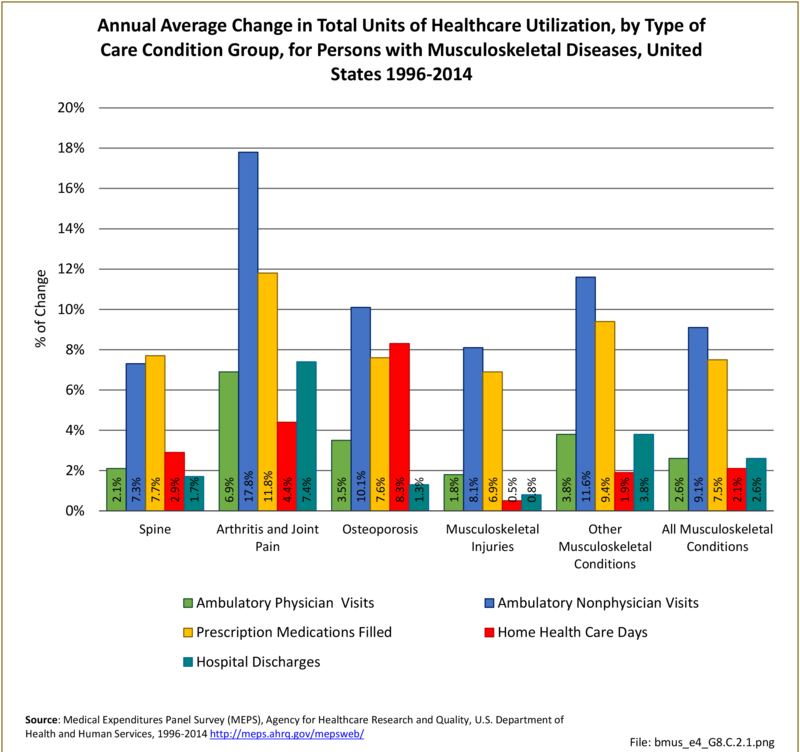 Except for arthritis and joint pain, incremental direct costs by condition grew more slowly than all-cause direct costs. 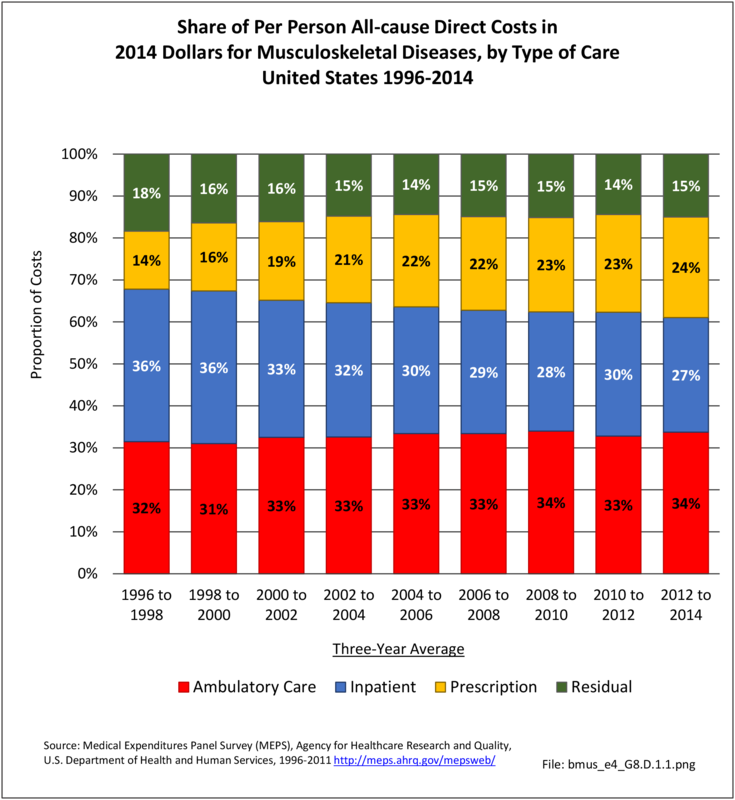 This is likely due to co-morbid conditions which may have a higher healthcare cost than some musculoskeletal diseases. 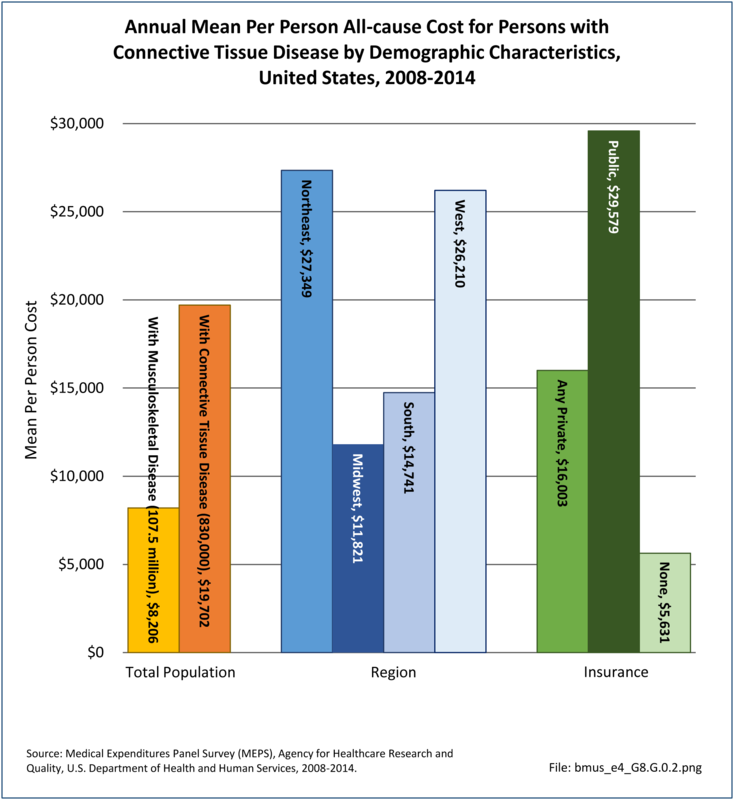 In general, groups of individuals with more expensive conditions who also are older and have more comorbid conditions will have higher per-person all-cause costs, while incremental costs are those attributable to the condition and less affected by age, other demographics, or comorbid conditions. 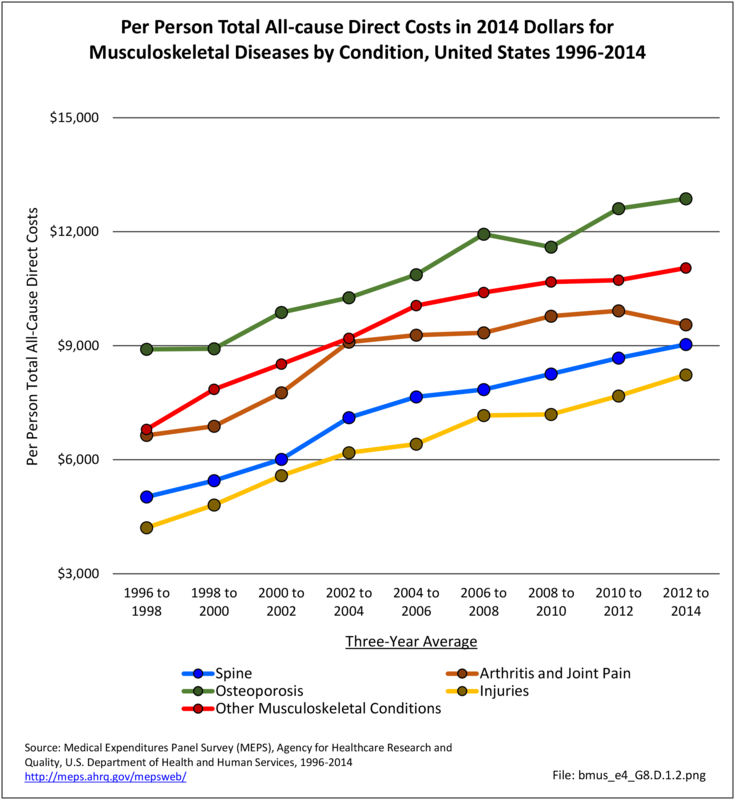 Detailed data related to per person incremental direct cost by condition can be found in specific condition data tables and are also discussed under the condition section. 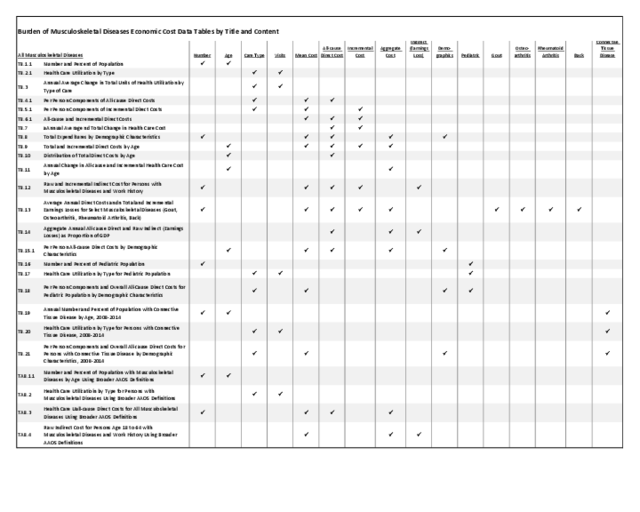 See spine (Reference Table 8.5.2 PDF CSV); arthritis and joint pain (Reference Table 8.5.3 PDF CSV); osteoporosis (Reference Table 8.5.4 PDF CSV); injuries (Reference Table 8.5.5 PDF CSV); other musculoskeletal conditions (Reference Table 8.5.6 PDF CSV); and summary (Reference Table 8.7 PDF CSV). 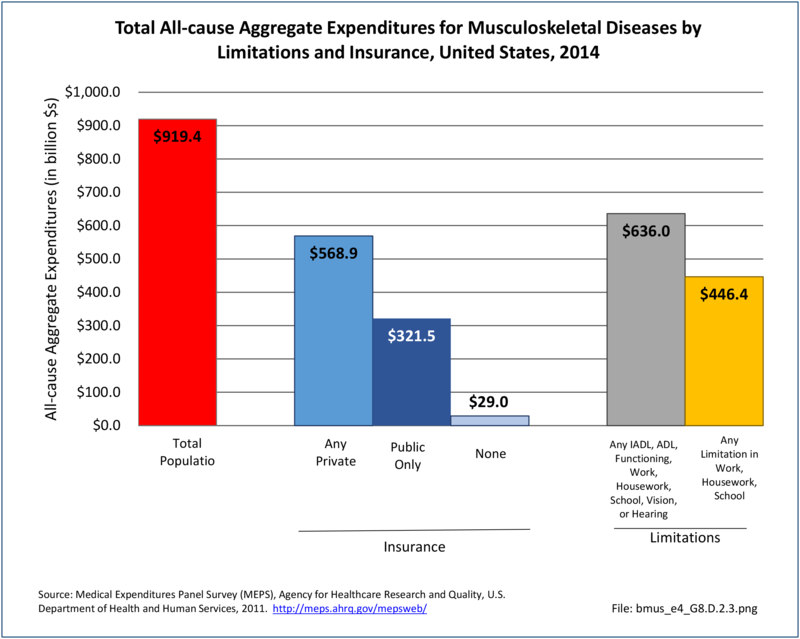 Expenditures for musculoskeletal diseases did not diﬀer substantially by gender and education level in 2015. 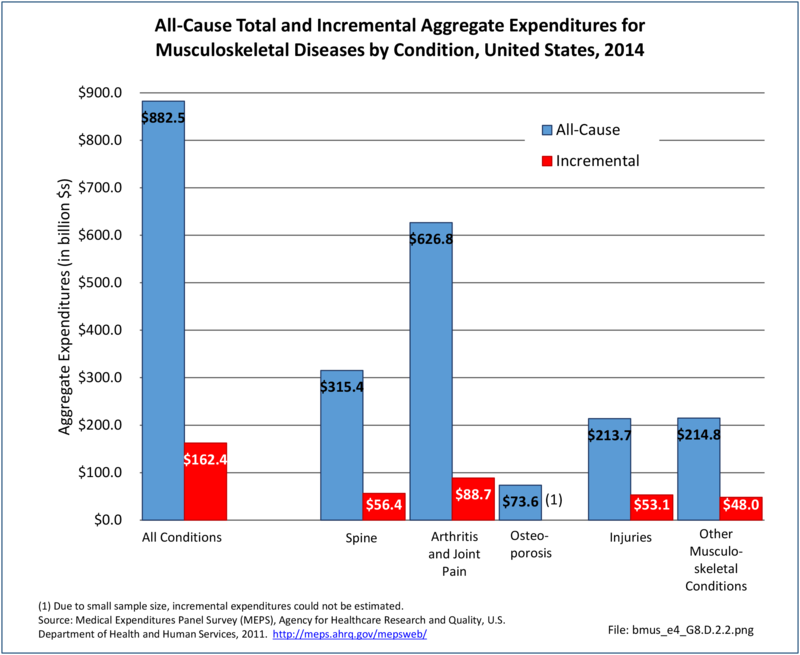 On an unadjusted basis, women with musculoskeletal diseases had only 3% higher per person average expenditures than men. 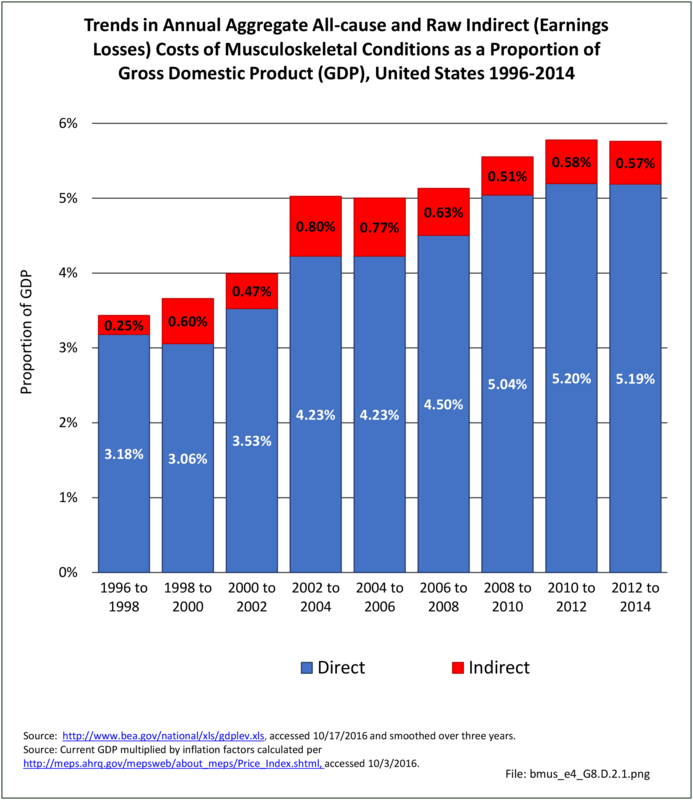 On the other hand, Hispanics report substantially lower annual per person expenditures than the other race and ethnic groups, for example 40% lower than non-Hispanic whites. 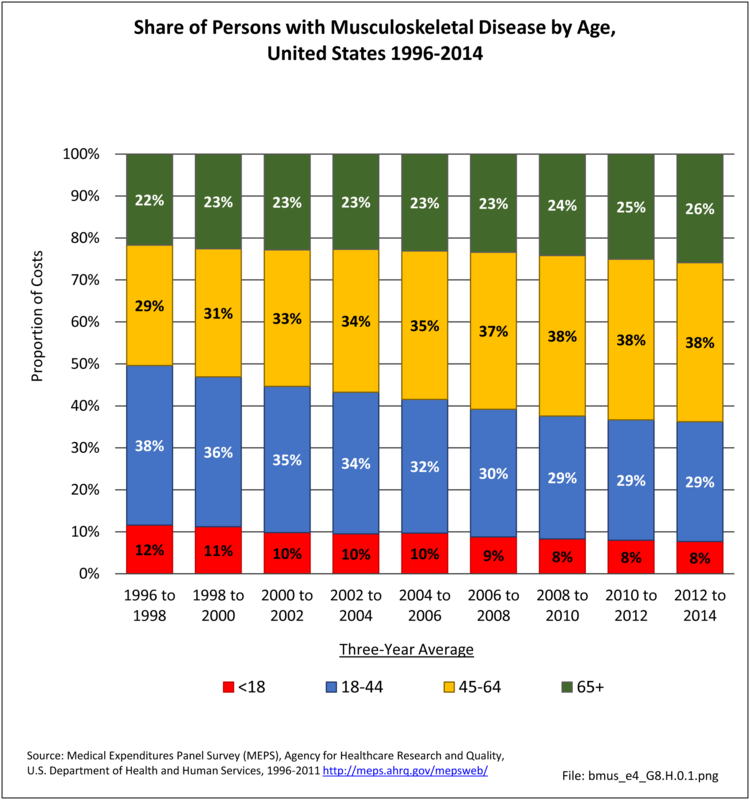 Individuals who were married or with partners or who were widowed, separated, or divorced had higher annual per person expenditures than those who were never married, probably due, in part, to age differences. 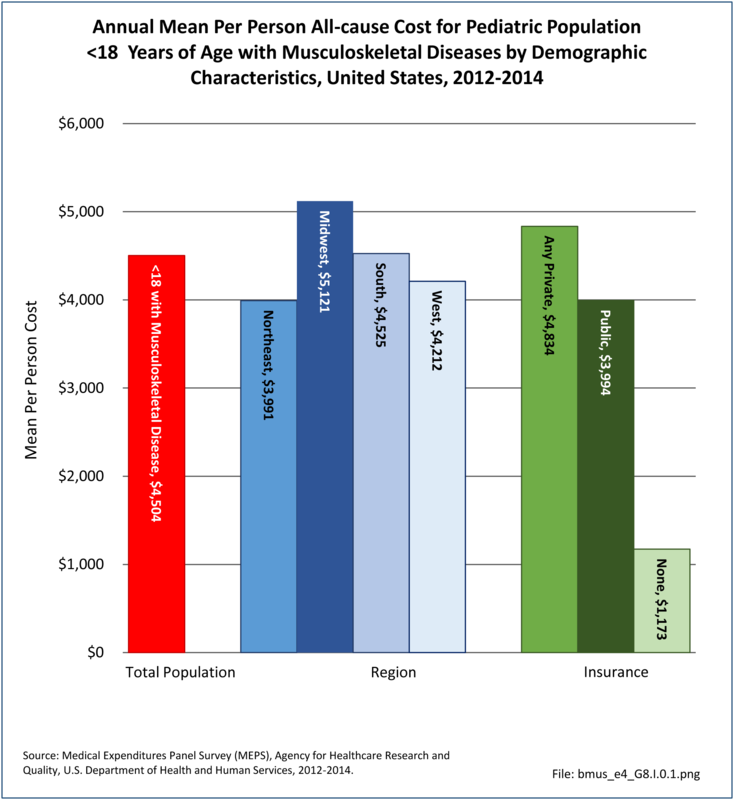 Aging is strongly correlated with increased per person all-cause medical expenditures for persons with a musculoskeletal disease along with other co-morbid conditions, but not necessarily so when attributed directly to musculoskeletal diseases (incremental cost). 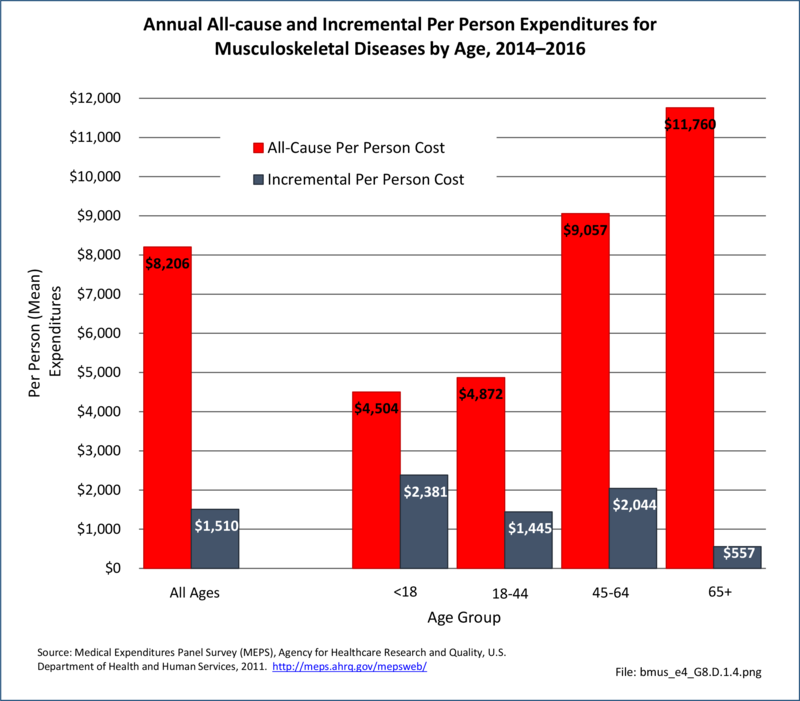 Per person all-cause expenditures in 2012-2014 for persons 65 years of age or older, at a mean of $11,760, were about 2½ times the mean per person costs for those under the age of 45.Persons aged 45 to 64 years had mean per person healthcare expenditures at around 75% that of the oldest population. 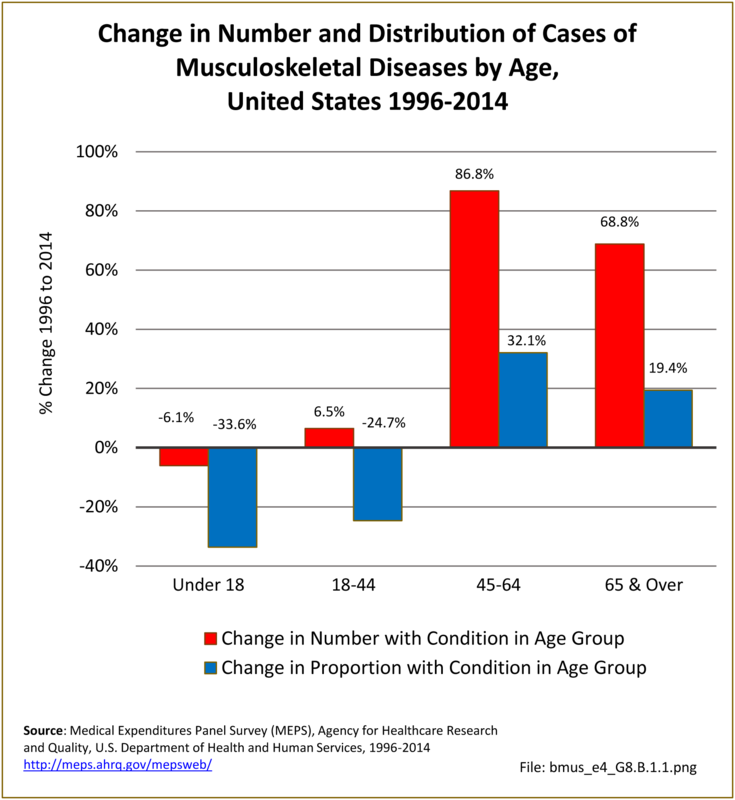 On the other hand, per person incremental costs in 2012-2014 were highest among those under age 18 and lowest among those 65 or over. 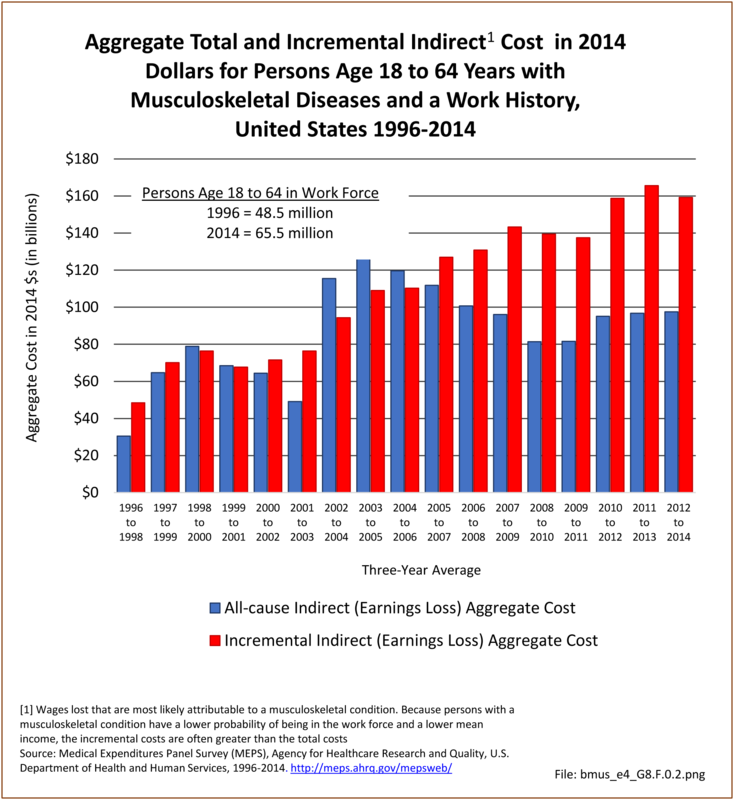 Since this incremental cost is the estimate directly attributed to musculoskeletal conditions, the reversal may reflect the fact that young persons are less likely to have co-morbid conditions, and when they do have a musculoskeletal disease, it accounts for a greater proportion of medical care. 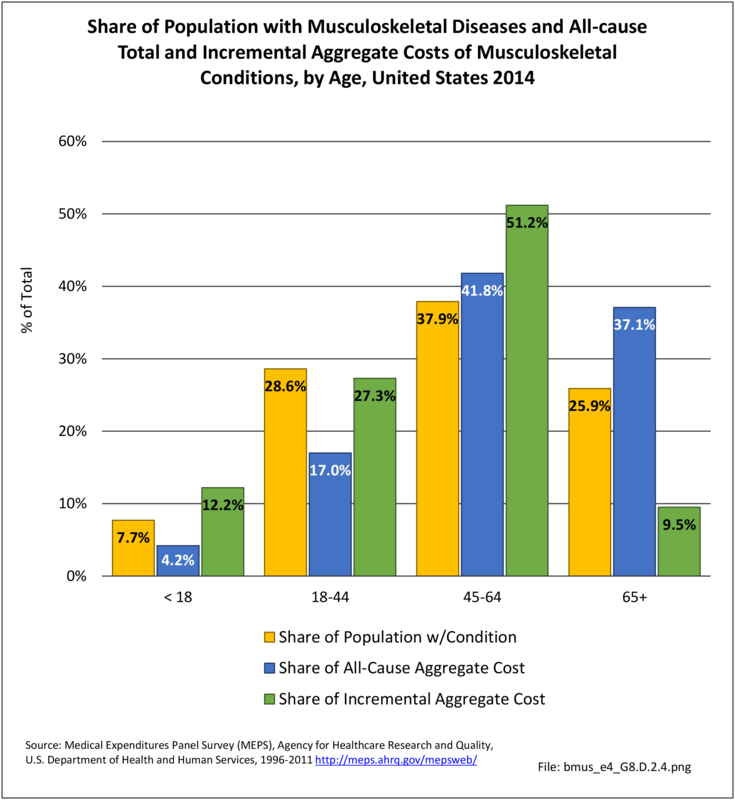 Conversely, those aged 65 or over are more likely to have multiple co-morbid conditions, reducing the share of cost attributed to the musculoskeletal condition(s). 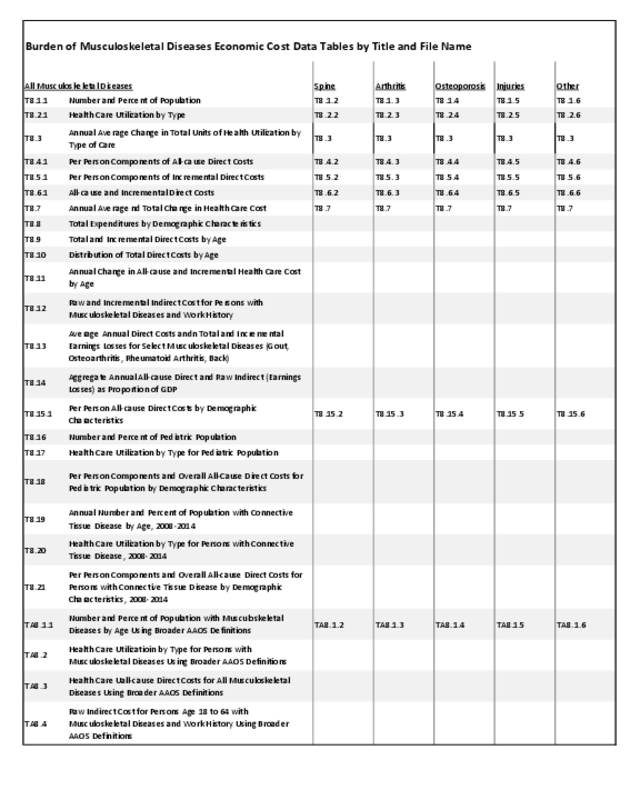 (Reference Table 8.9 PDF CSV).